Gotham Book Mart's massive collection of art and writing, estimated to be worth several million dollars, was scooped up by an anonymous buyer and donated to the University of Pennsylvania Rare Book and Manuscript library, the Times reported today. The collection was a New York gem; it included first editions, postcards, rare and unusual magazines, and hard-to-locate books from small or shuttered presses. There were books from the personal collections of Truman Capote and Ana&iuml;s Nin, and signed items from Arthur Miller, Tennessee Williams, Robinson Jeffers, Woody Allen, Wallace Stevens, and John Updike. Miller, Williams, Updike, and other legends like John Dos Passos, H.L. Mencken, Eugene O'Neill, J.D. 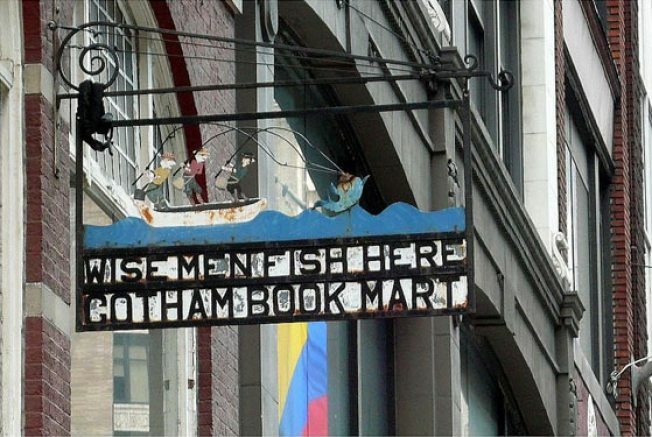 Salinger, and Allen Ginsberg used to hang out at the shop, or even work there. Collecting and selling books since 1920, the shop sputtered out of existence in 2007. The Times guesses that either Leonard Lauder or Edmondo Schwartz, philanthropists who had rescued the Mart before, was behind the purchase and donation. We're glad the collection was saved and remains intact, but come on, taking it away from the city of writers, the city that built it up? To Philly? To Penn? That's some serious alma-mater devotion, right there.